We've just released a bug fix for exporting where an export would fail to be generated due to users in the account having very large email signatures. As part of this bug fix, we have also made exporting contacts faster. 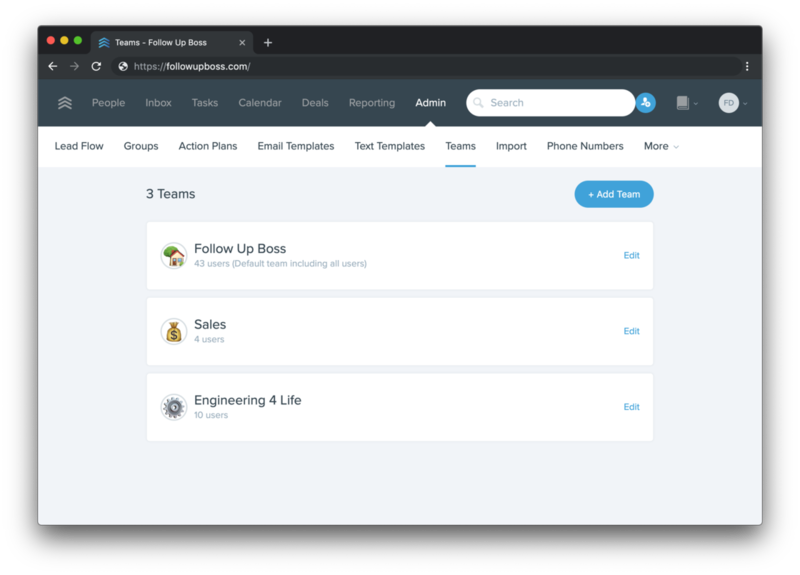 All customers on the Platform plan now have access to the "Teams" feature. If your account has many agents, this feature allows you to group agents in different teams and even assign team leaders. The user table has been update to reflect a more accurate "last seen" Web time based on FUB2 activity (it used to show last login time). The table also now includes a total member count. You can now delete your emails from Follow Up Boss, and optionally trash them in your Gmail account. We made huge performance changes when you're editing the rules for a lead flow. It is much more responsive and fluid to use. Before, when a change was made, the entire screen would flash, or on larger rule lists, it'd take 3s to add a new condition. This is not immediate no matter the number of rules. You can now move a shared inbox phone number to another shared inbox. This will help keep things organized and consolidate communications as well. To move a number to another shared inbox, visit the phone number management screen, and the "actions" now contains a "Move number" option. Simply choose the inbox you wish to move the number to, and hit "Move". Sorting on user table now works. When sorting, the first click sorts ascending, second descending, and one last click will return to the default sort order (which is based on role). For some columns such as Phone or Connected Email the sorting is based on if there is a value or not, so you can see who still needs to add a phone or connect an email to Follow Up Boss. We moved the user cards to a table view. This new look has all the same functionality as the old view, but allows you to view more data with less screen. Shared inbox phone numbers now support labels. This is particularly useful with the new Company Inbox which includes the company phone number as well as its own inbox number. Labels are a great way to distinguish the source of incoming/outgoing calls and texts. To edit inbox number labels, visit the phone management screen, under "actions" for a shared inbox number hit "edit label". Columns would sometimes revert, this is now fixed. Surely Follow Up Boss will start publishing changelogs very soon.